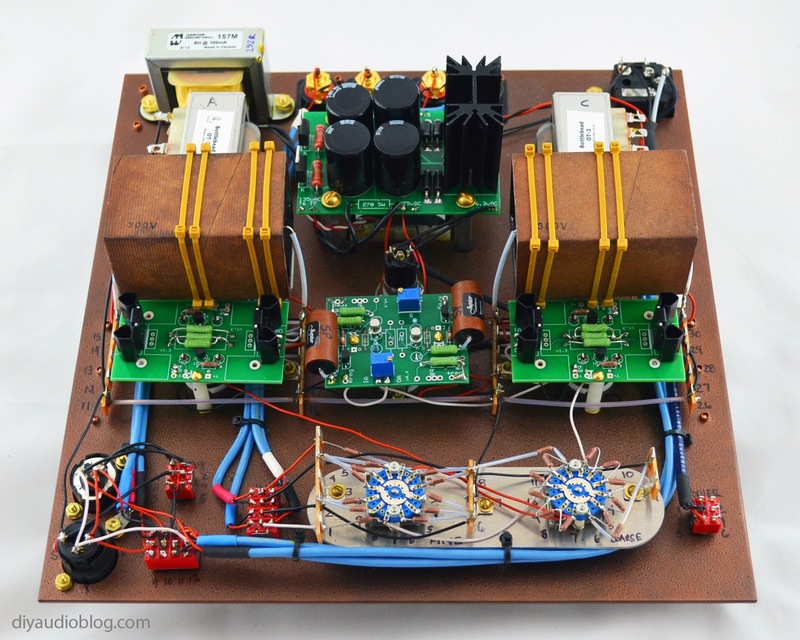 If you are not already familiar with Bottlehead, they make some fantastic audio kits, mostly tube-based, to power sensitive speakers and headphones. They have some other cool stuff too like a guitar amp, so check them out if you haven't already. Stepping away from the marketing side of things, the Mainline is a headphone amp... and yes, I am building ANOTHER headphone amp. I'm beginning to think I might need to grow a few more ears. The Mainline should be good enough, refined enough, that I won't have to build another for a while... we will see. The Mainline offers a balanced output for those of you lucky enough to have balanced headphones. If your headphones aren't balanced, you can contact Zynsonix Audio for the conversion, or just take the boring route and use the single ended output on the amp. The Mainline has 3 tubes in total. 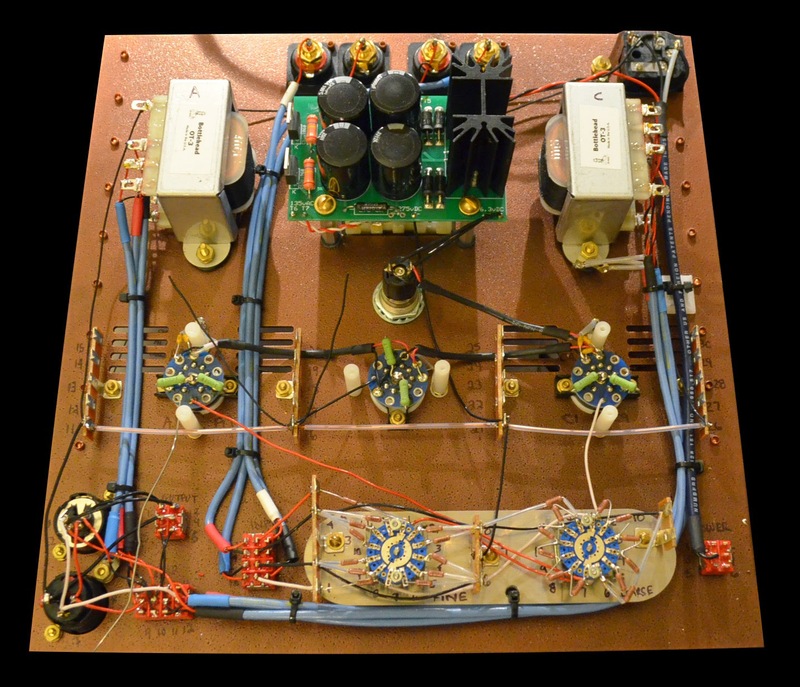 A 12AU7 is used for power duty and two 6C45-Pi tubes take care of the signal. 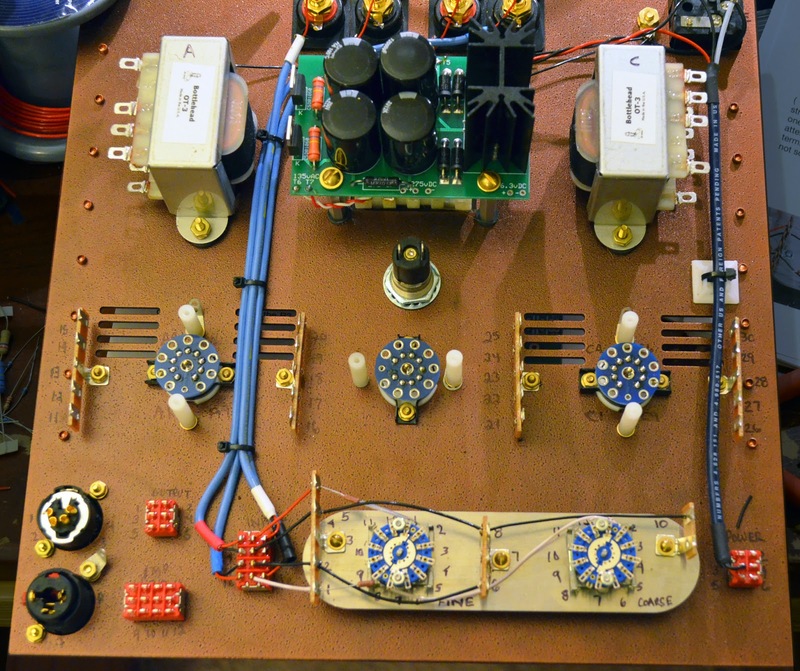 The signal tubes each get their own C4S board (often an upgrade on other Bottlehead kits) which provides an active load for the tubes and improves sound quality. 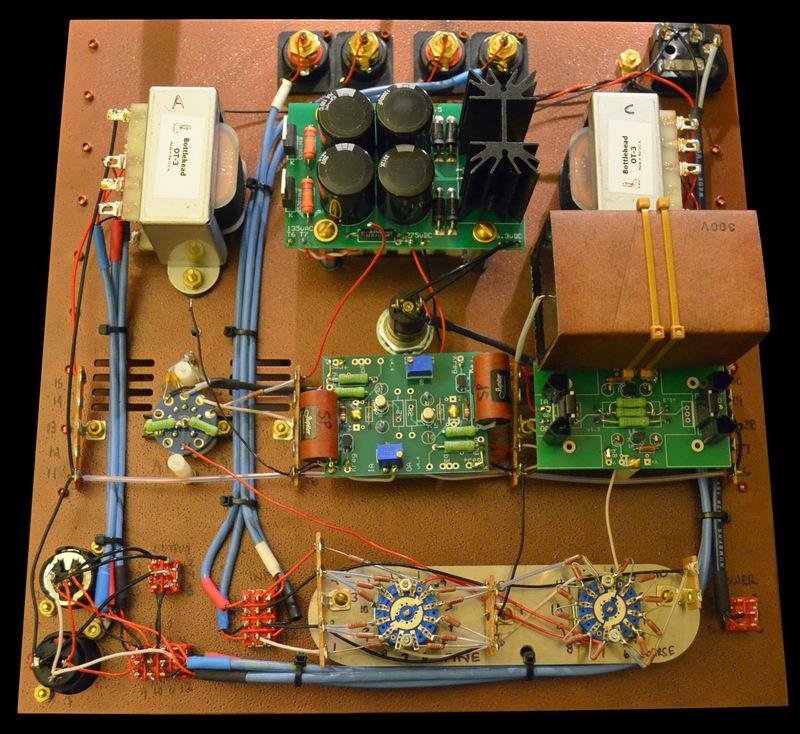 The output is a healthy 600mW with adjustable impedance. 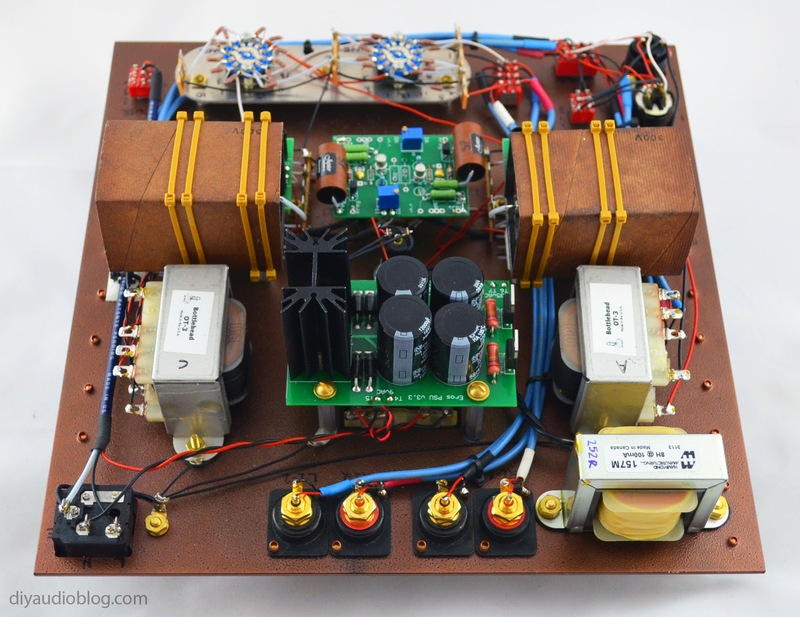 Doc, the head honcho at Bottlehead, has stated that the amp works well with the more power-hungry Audeze LCD series. It features the same volume attenuator as the BeeQuiet upgrade that Bottlehead offers on their top-of-the-line BeePre pre-amp. Using a pair of knobs labeled "coarse" and "fine", you adjust the volume. The coarse attenuation has 9dB steps (from 0dB to -45dB) and the fine adjustment has 1.5dB steps (from 0dB to -7.5dB). 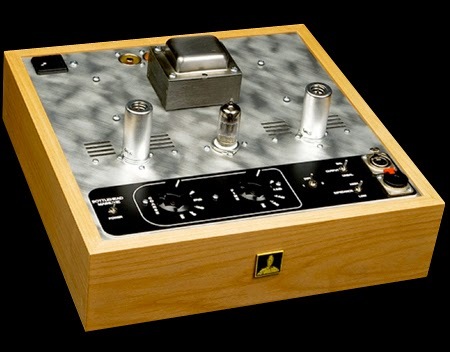 The Bottlehead gear makes use of a gravity mount, which uses a wood frame with a rabbeted edge to hold up an aluminum plate, which all the parts are mounted to. It's a nice easy way to make a chassis if you don't have a metal bender and it looks nice too. 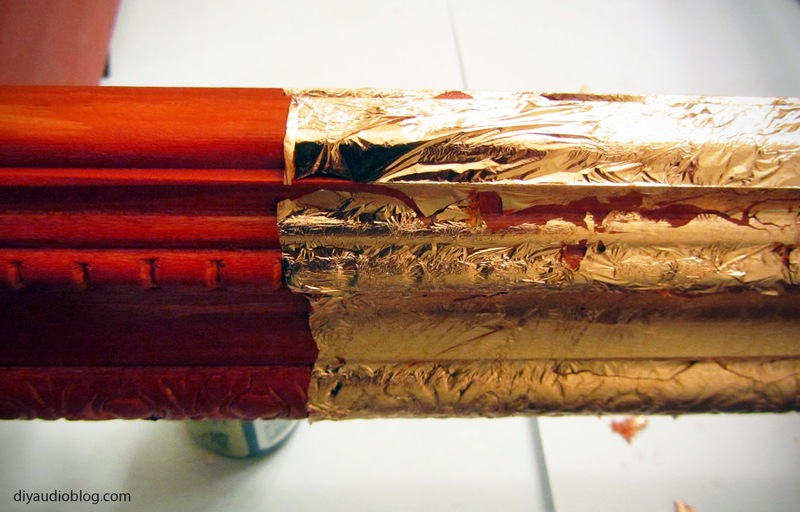 I like to build my own with some decorative molding and then copper leaf it, which is a process where you take extremely thin sheets of metal and adhere them to the wood surface. If you've seen my other builds, I tend to switch out some of the parts for my own personal favorites I've found over the years, namely Teflon tube sockets, Cardas wire, Kiwame resistors, and various boutique capacitors. That being said, the quality of the parts included with the Bottlehead kits is perfectly good, so don't feel like you have to swap things out. Below is the initial mounting of the parts with a little bit of wiring done. The teflon tube sockets have blue PCBs mounted that give you some extra room for soldering. The blue wires are Cardas 23.5 x 2. The design calls for shielded wire, so the mesh shields are grounded to the chassis. 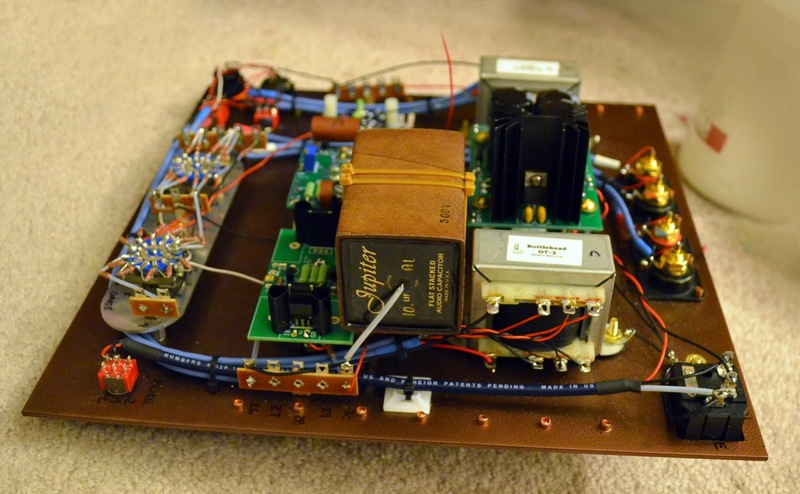 You'll note the large Jupiter beeswax flatstack 10uF capacitor mounted on the right. I initially was going to mount a piece of FRP material then mount the caps to that, however I ended up with a standoff and a capacitor mount instead, it offered a slightly cleaner look. The cap narrowly avoids touching the transformer and the clip on heatsinks, and the leads are just long enough to reach. The cool gold colored zip ties are from Michaels craft store. I re-oriented the capacitor for the final build when I was satisfied with the fitment (outer foil faces inward on the right cap). These are big caps (big and beautiful!) so they needed a second standoff with capacitor mount to keep them nice and secure. After some listening tests with the resistor and the choke, I couldn't really tell a difference, but since I had the choke already, I went ahead and installed it. It fits so nicely in the corner. 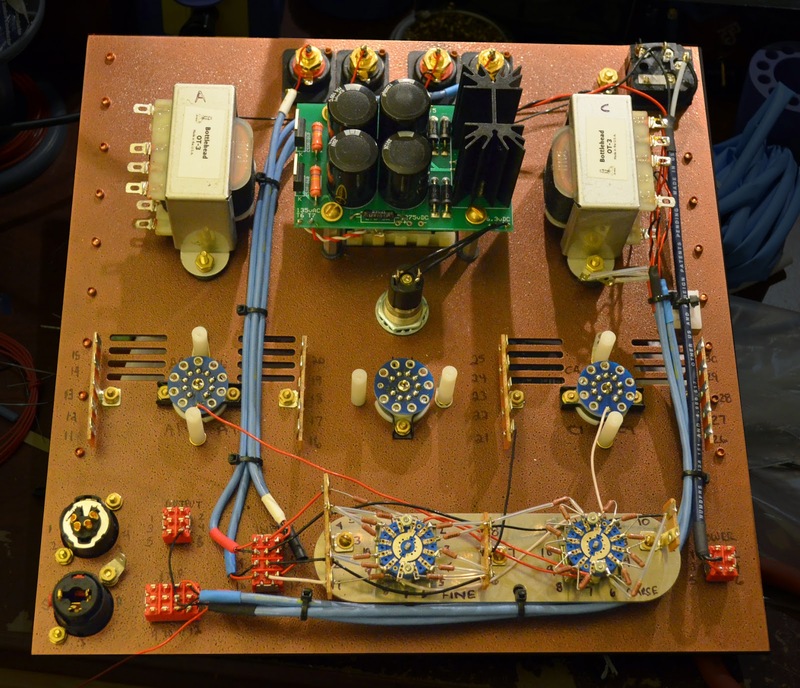 This is the final photo of Bottlehead's most sophisticated headphone amplifier to date (at least publicly available, maybe they have something spectacular going on behind the scenes). The knobs, if anyone is wondering, are matte aluminum made by KILO. You can purchase them from Digikey or Allied Electronics. The copper colored tube shields I believe were from Angela Instruments. Hope you enjoyed this post. Be sure to visit Zynsonix Audio if you need a great sounding headphone cable or some new interconnects to connect your Bottlehead gear. 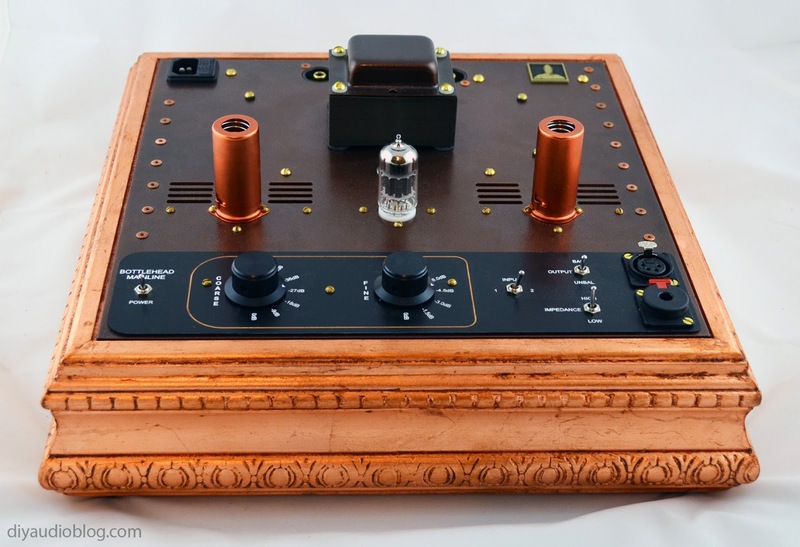 The owner of this blog and Zynsonix Audio LLC do not have any affiliation with Bottlehead. Please remember that building/modifying circuits can be dangerous to you and/or your surroundings and should only be performed by a certified technician. The owner of this blog and all associated parties can not / will not be held responsible if you attempt a build or modification posted above and cause physical harm to yourself or your surroundings. Many electronics contain high voltages that can kill, and mods, if performed improperly, can be a fire hazard. Please keep this in mind. Inspiring work as usual, looking forward to taking delivery of my own one soon. Hi, where did you source the vintage look power on light from?